Bright Folk Art pieces from the garden bring fresh, lively style to a simple white room. Read a few of the tips below and you can create a look like this with a few items found around the house, a couple of clear vases and a pile of sunflowers. Against a back drop of clean lines and simple furnishings, a collection of folk art pieces and flowers give this living room a fresh, country garden feel. 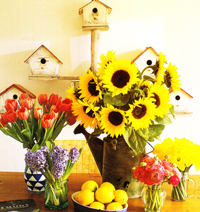 Focusing on a few decorative birdhouses, apples, and sunflowers, keeps this lighthearted look unified and uncluttered. The mantel over the fireplace is filled with clear glass vases that hold single stems of fresh or silk sunflowers. 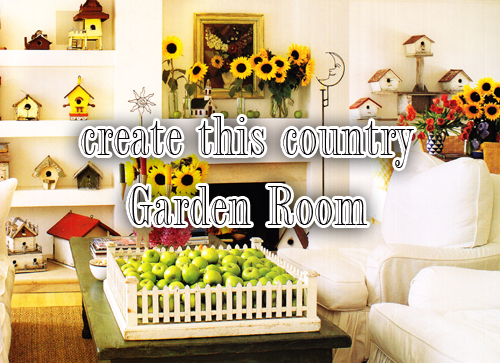 A few green apples and a birdhouse area tucked between the vases to break up the look. None of these vases are expensive. You can use glass jars, or even a piece of clay pottery without a lot of fuss. The same floral theme is in the added to a side table behind the couch and the coffee table in front of the couch. Simple yet stunning! A tabletop garden style display features birdhouses, antique display items like a candle holder and a shelf unit. A small vase of flowers sits between these to add bright splashes of sunflower yellows. The picket fence bearing a harvest of green apples recalls Grandmother cottage. The little vignettes with favorite object make decorating fun and you can change them as often as you like, seasonally or just on a whim. Use a water can to hold more flowers and sit a bowl of lemons underneath. The color accents the sunflowers and the smell is heavenly. Simple, colorful & easy to do. Give it a go and tell us how it worked for you. Read more.....Decorate your own garden pot - here's how! Read more.....turn problems into pleasures.